The occasion is the marriage of June McMenamin, daughter of Madeline Bogner and Paul McMenamin, to Al Finkel. 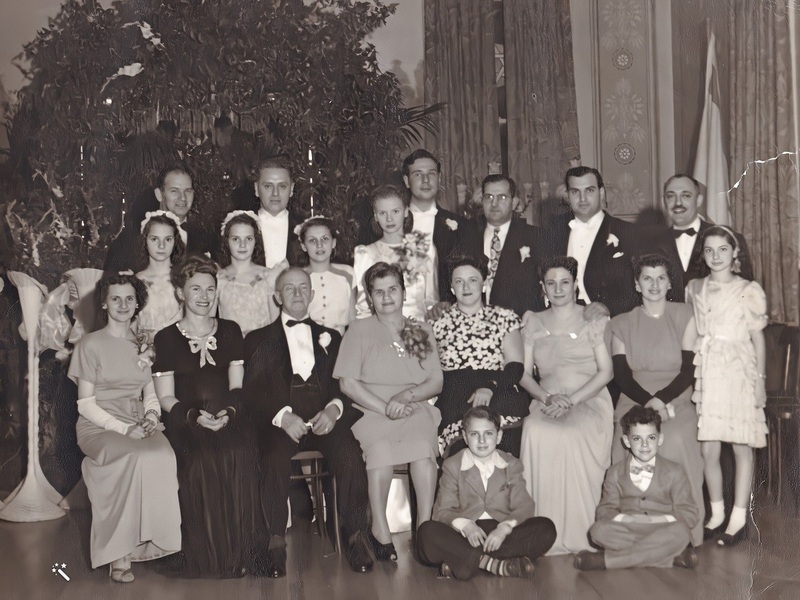 Front row: Madeline Bogner McMenamin, Frances Bogner, Max Bogner, Adele Zeif Bogner, Margaret Bittlingmeier Bogner, Rita Kesselhaut Bogner, Julia Bogner Kesselhaut, and Gail Kesselhaut. Center row: Twins, Joanne & Jocelyn McMenamin, Jackie Bogner, and the bride, June McMenamin. Men in back row: William Bogner, Paul McMenamin, June's husband Al, Jack Bogner, Henry Bogner, and Harry Kesselhaut. 2 boys in front: Ronnie Bogner and Alan Kesselhaut.